^ 5.0 5.1 Guillermo, Emil, A first taste of empire, Milwaukee Journal Sentinel, February 8, 2004: 03J. .
^ PHILIPPINE INSURRECTION. The Polynational War Memorial. ^ Arnold, James R. The Moro War: How America Battled a Muslim Insurgency in the Philippine Jungle, 1902-1913. Bloomsbury Publishing. 2011. ISBN 978-1-60819-365-3. ^ Minahan, James. Encyclopedia of the Stateless Nations: L-R. Greenwood Publishing Group. 2002: 1323. ISBN 978-0-313-32111-5. ^ Renato Oliveros. Islam in the Moro-American War(1896-1916), the Philippines. Lambert Academic Publishing. 2010. ISBN 978-3-8383-4701-1. ^ Ocampo, Ambeth R., The First Filipino Novel, Philippine Daily Inquirer, January 7, 2005. ^ Philippine Attractions - The Sideco House - Localphilippines 互联网档案馆的存檔，存档日期2015-04-02. See also Wikisource:Letter from E.S. Otis to the inhabitants of the Philippine Islands, January 4, 1899. ^ 47.0 47.1 Agoncillo 1990，第216页. ^ 51.0 51.1 Philippines: United States Rule. U.S. Library of Congress. [2007-07-04]. ^ Worcester 1914，第309页, citing Report Philippine Commission, Vol. I, p. 183. ^ 57.0 57.1 Miller 1982，第89页. ^ San Francisco Call February 14, 21, 23, March 30, 31, May 29, June 9, July 17, 1899. ^ 70.0 70.1 "Jacob F. Smith."(2010). Encyclopædia Britannica Online. Retrieved September 30, 2010. ^ John M. Gates, Ch. 3, "The U.S. Army and Irregular Warfare". .wooster.edu. [2012-06-05]. （原始内容存档于2014-06-29）. ^ E. San Juan, Jr. U.S. Genocide in the Philippines: A Case of Guilt, Shame, or Amnesia?. March 22, 2005 [October 3, 2007]. （原始内容存档于2009年6月22日）. ^ 75.0 75.1 Miller 1982，第88页. ^ David Brody. Visualizing American Empire: Orientalism and Imperialism in the Philippines. University of Chicago Press. 2010: 69–71. ISBN 978-0-226-07534-1. ^ THE WATER CURE DESCRIBED. ; Discharged Soldier Tells Senate Committee How and Why the Torture Was Inflicted (PDF). The New York Times. May 4, 1902: 13 [March 29, 2008]. ^ 88.0 88.1 88.2 88.3 Act No. 926, enacted October 7, 1903, ChanRobles law library. ^ Act No. 1120, enacted April 26, 1904. ^ 91.0 91.1 91.2 Escalante 2007，第219页. ^ 96.0 96.1 Escalante 2007，第48–54页. Legarda, Benito J. Jr. (2001). 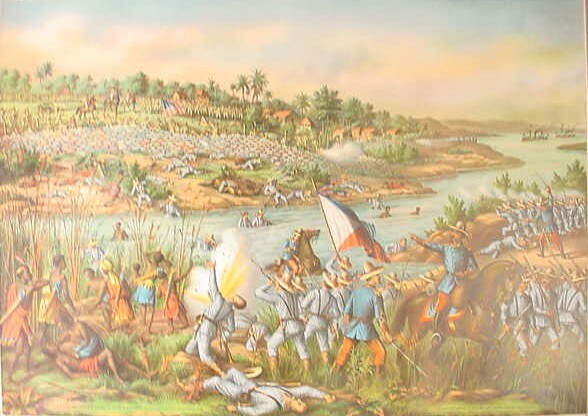 The Hills of Sampaloc: the Opening Actions of the Philippine–American War, February 4–5, 1899. Makati: Bookmark. ISBN 978-971-569-418-6. Stewart, Richard W. General Editor, Ch. 16, Transition, Change, and the Road to war, 1902-1917", in "American Military History, Volume I: The United States Army and the Forging of a Nation, 1775-1917", Center of Military History, United States Army, ISBN 0-16-072362-0. Storey, Moorfield and Julian Codman legal counsel for the Philippine Investigating Committee. (1902). Secretary Root's Record:"Marked Severities" in Philippine Warfare — Wikisource. Arnaldo Dumindin. 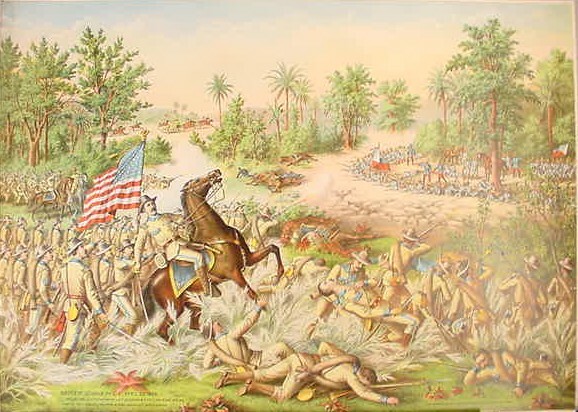 Philippine–American War, 1899–1902. Images from the Philippine-United States War. historicaltextarchive.com. [2006-05-20]. （原始内容存档于2006-05-14）. The Philippine Centennial Celebration. MSC Computer Training Center. [2006-05-20]. A brief description of the war between the United States and the Philippines, which began in 1899. The Philippine Revolutionary Records at Filipiniana.net (archived from the original on 2009-05-25).